Out of pocket costs for people accessing opioid replacement therapy can make it hard for some patients to take their medication consistently, warns Dr Chris Freeman, national president of the PSA – leaving them potentially vulnerable to relapse. His comments follow a piece in newsGP in which prominent doctors called for a full federal government subsidy for the medication, in the light of not just concerns about illicit opioids, but medicines such as fentanyl and morphine. newsGP’s Doug Hendrie spoke to Dr Simon Holliday, the rural NSW GP and methadone service provider who first challenged Health Minister Greg Hunt about the cost of accessing the service, at a GP conference in 2017. Dr Holliday, who has still not had his questions about the “hidden” costs of the service answered by the Department of Health, told Mr Hendrie that the lack of full subsidisation for the service is a “gross omission based on fear, stigma and moralising”. “We know that opioid-substitution therapy is very evidence-based and highly cost effective,” he told newsGP. “For every $1 spent on opioid-substitution therapy, there is $7 in benefit for the community. “This very simple change could make an impact on everything from mental health outcomes, indigenous health outcomes, parenting, returning to work, unemployment and crime rates. newsGP also spoke to John Ryan, CEO of the Pennington Institute, who has previously called for full subsidy of the methadone program and who said that people were “generally without resources” after a serious problem with dependency, and who often left the program due to its lack of affordability. He warned that people with dependencies are now moving to stronger opioids, including fentanyl and morphine, to self-medicate in a “cost-effective” manner due to the lack of dispensing fees involved in receiving these. Dr Hester Wilson, Chair of the RACGP Addiction Medicine Specific Interests network, also supported the subsidy call. 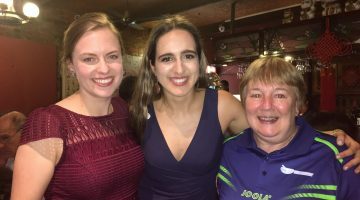 “Given this is a group of people who quite often struggle to make financial ends meet, it would make sense for the Government to support the cost of pharmacy dosing,” she said. She pointed out that patients who have been able to access free dosing at public clinics, where this exists, are generally shifted to community pharmacy after being stabilised, allowing the clinics to take on more patients. A spokesperson for the Health Department said that this year’s Federal Budget, handed down on April 2, includes $268 million in funding for Australians with drug and alcohol issues, including $7.2 million earmarked to increase access to naloxone. PSA’s Chris Freeman later told the AJP that this latter announcement was a “drop in the ocean” and called for “genuine investment” in access to naloxone, as well as methadone and bupropion. He pointed out that having access to naloxone is not only important for people using illicit opioids or misusing licit ones, but also those taking opioids regularly and appropriately under medical advice. 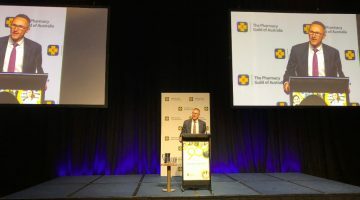 The Australian Greens are taking a plan to the 2019 election which would fund dispensing fees for patients using methadone; party leader Senator Richard Di Natale outlined this policy at the 2018 Pharmacy Guild Parliamentary Dinner, and reiterated it during the recent launch of the PSA’s Pharmacists in 2023 report in Canberra. 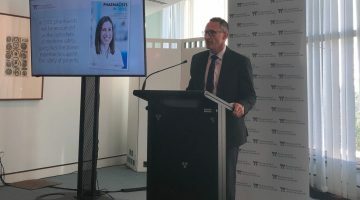 “We were pleased when Senator Di Natale presented at the launch of Pharmacists in 2023 and made the commitment that the Greens would seek to fund opioid replacement therapy through community pharmacy,” Dr Freeman told the AJP. Senator Richard Di Natale speaks at the PSA’s Pharmacists in 2023 report launch. “We look at this from a harm minimisation perspective. “People who are in receipt of opioid replacement therapies like methadone or bupropion are very vulnerable. These people have an addiction, and are seeking medical treatment to try and overcome that. Dr Freeman said that in his personal experience, patients have had to consider forgoing that therapy as they may not be able to afford it in any given week or month. “This puts them at risk of reverting back to using, because if they can’t afford these costs, but they’ve got access to illicit substances they may have been using, they may use that instead. “Sometimes that can cause relapses to occur, if there’s a break in treatment,” he said. “So this is a serious problem. “Most of the out of pocket expenses aren’t large, but over the lifetime of treatment they can add up for an individual. “Many of these people, because of their illness, many not be working, so money is tight for them. “However it’s also not fair for community pharmacy to pay the bill either. It’s a clinical service which pharmacies are providing, which is highly valued, and there’s good evidence to show it does assist in the management of opioid addiction. “So community pharmacy shouldn’t have to fund it. This should be considered like any other medical treatment which is covered through the PBS. These people have a medical need; they’re being prescribed this treatment; therefore from an access point of view there should be funding to support that nationally.